(NaturalNews) Following the unexplained deaths of several thousand birds over the last two weeks, events are now emerging that may offer a physics-based explanation for the mysterious deaths. It all begins on a runway in Tampa, where airport officials recently closed that runway in order to change the numeric designators painted there. Why are those numeric designators being changed? Because the Earth's magnetic poles are shifting and the numbers previously painted on the runway no longer match up with the magnetic measurements of sensitive airplane instruments (http://www.physorg.com/news/2011-01-tampa-ai...). The Earth's magnetic field is extremely important for protecting the planet from so-called "solar wind" and other electromagnetic influences from space. The magnetosphere, which is driven by the Earth's magnetic field, serves as a kind of electromagnetic barrier to prevent dangerous rays from reaching the surface of the planet. Physics Fact #2: The Earth's magnetic field has flipped hundreds of times in the past. The Earth's magnetic field "flips" (or reverses polarity) every few thousand years. This is called a geomagnetic reversal (http://en.wikipedia.org/wiki/Geomagnetic_rev...). In between these flips, the magnetic field can become quite weak and chaotic, causing "turbulence" in the field, which can effectively cause weaker gaps in the magnetosphere. Last week, a report from the Russia's Ministry for Extraordinary Situations (MCHS) (http://en.wikipedia.org/wiki/Ministry_of_Eme...) warned that the weakening Earth magnetosphere was allowing "poisonous space clouds" to enter deep into Earth's atmosphere where it is coming into contact with birds. These "space clouds" are called Noctilucent clouds (http://en.wikipedia.org/wiki/Noctilucent_clo...), which exist at very high altitudes (roughly 50 miles) and accumulate space dust from micrometeors and other sources. What's really interesting here is that these noctilucent clouds exhibit very high radar reflectivity (http://media.caltech.edu/press_releases/1318...). This means these clouds create a very large radar signature on weather tracking systems. Physics fact #3: Noctilucent clouds have very high radar reflectivity. Now here's where this story gets really interesting: On New Year's Even when birds began falling out of the sky in Arkansas, the National Weather Service in North Little Rock documented an unusual phenomenon on their radar monitors. "There are some indications that we're picking up a non-precipitation target," said Science and Operations Officer Chris Buonanno at the NWS (http://www.todaysthv.com/news/local/story.as...). He went on to explain that the radar signature definitely was not indicative of a cloud or rainstorm. It was something altogether different. At or around the same time this radar image appeared, birds began falling out of the sky. The working theory in all this, at least for the birds, is that deadly space clouds are reaching into the lower atmosphere and killing these birds in flight, after which the birds fall to the ground. The reports of the birds experiencing "blunt trauma" are likely from the birds hitting the ground. What, exactly, would be found in these deadly space clouds that might be killing the birds? One possibility is that these clouds might be moving along with gaps in the magnetosphere that would invite deadly radiation to "fry" the birds in flight, as one possibility (although this explanation seems unlikely, see below). I'm not aware whether tissues tests have been done on these birds to determine whether they died of intense radiation poisoning. It would also seem that if radiation reached so low into our atmosphere, it would have killed many plants and trees in the area, and there's no evidence of that occurring, at least not that I'm aware of. Another possibility is that the deadly space clouds could have frozen the birds in flight with blasts of extremely cold air. But such an event also would have seemingly impacted the trees and plants at ground level, and there's no evidence of that occurring either. The really concerning part about all this is the sudden realization that if these poisoning clouds of Hydrogen Cyanide could reach into our lower atmosphere, they could also theoretically reach ground level. That's where humans live, of course, and if such a poisonous cloud reached down into a major city such as New York, it would cause the mass instantaneous death of potentially millions of people. Interestingly, a key chemical use of Hydrogen cyanide was developed by none other than IG Farben, the Nazi war era criminal pharmaceutical giant that was later broken up to become today's pharmaceutical giants, including Bayer. Hydrogen cyanide is widely recognized as a chemical weapon and is even used on the tips of whaling harpoons to murder whales. Physics fact #4: Hydrogen cyanide kills birds and humans very quickly. Is this the result of a weapons test or attack? That it is used as a chemical weapon might make some people wonder whether all this is fallout from some kind of weather control weapons experiment. It's not a crazy idea: Scientists in Abu Dhabi have experienced tremendous success bringing rain to that city through the use of weather control systems engineered in Europe (I'll be posting a full story on this shortly). Although we have no direct evidence of this, it is conceivable that HAARP technology could be altering the magnetosphere in ways that are contributing to the invasion of our lower atmosphere with these Noctilucent clouds compose of Hydrogen cyanide. This is just a wild guess at this point, however. We don't have any evidence that this is really happening. But if it were, that would be a very clever weapon, indeed: Aim your weapons at the atmosphere above an enemy city, fire it up and wait for Hydrogen cyanide gas to kill off everybody in a minute or two. Then you turn off your beam weapon and play it all off as some sort of "freak natural disaster" or unexplained atmospheric mystery. There is speculation, of course, that these bird deaths occurring in North America right now are really a test of precisely the weapon system I've described above. But this is just speculation, of course. We don't have any hard evidence that such a system is being used, nor even that it is possible. 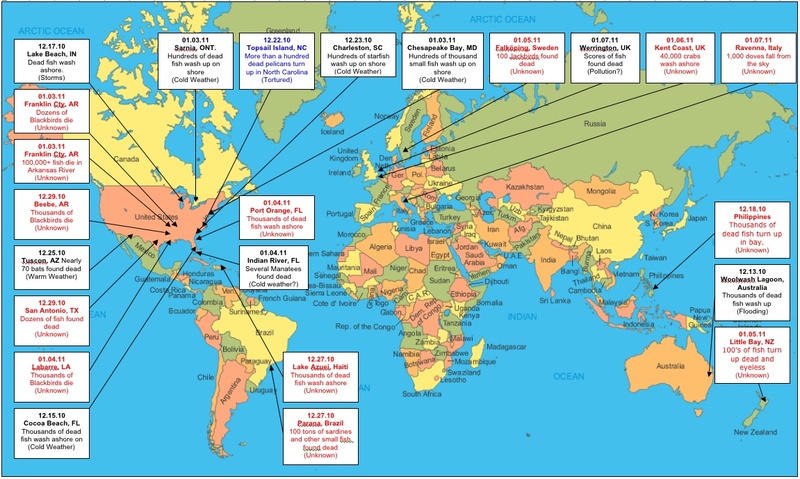 The official HAARP website (http://www.haarp.alaska.edu/) describes itself as a "facility for the study of ionospheric physics and radio science." It then displays a diagram showing HAARP waves bouncing off the ionosphere, beaming through "irregularities" and finally reaching a satellite in high orbit. These satellites are typically placed in geosynchronous orbits at roughly 26,000 miles above the Earth -- far higher than the 50 miles or so at which the Noctilucent clouds are located. This is a U.S. Government Computer System. This computer system operates as a world wide web server to provide information to the public concerning unclassified programs only. ...Unauthorized attempts to upload or change information; to defeat or circumvent security features; or to utilize this system for other than its intended purposes are prohibited and may result in prosecution under the Computer Fraud and Abuse Act of 1986 or other applicable statutes and regulations. Does this mean HAARP is a weapon being used to cause poisonous space clouds to enter the lower atmosphere and kill the birds? Not at all. That would be a leap at this point until we know more. But we do know that HAARP isn't talking about what it does, and that it is more than just a "radio science experiment." We also know that weird things are happening to our planet's magnetic poles and weather systems. We know that birds are literally falling out of the sky dead. These facts are not to be taken lightly. They might be caused by "natural" events, or conceivably they could be influenced by man-made events. In either case, something that could very easily threaten life on our planet may be afoot, and there's no logical reason to conclude it will be limited to birds and fish. I've seen reports of some doctors chiming in on all this and blowing it off as "normal" deaths of birds and fish. Conventional doctors, of course, are the world's most experienced experts at missing the big picture, and they seem to haphazardly discount the most important fact about all this: Sure, birds and fish die every day. But not en masse. They don't usually fall out of the sky by the thousands, in other words. These are obviously not normal events where birds are dying of normal causes. That much is obvious to everyone... except the doctors, it seems. In conclusion, I can't explain these mysterious deaths with any high degree of confidence at this point. But I do know that thousands of birds don't fall out of the sky for no reason. There is an underlying cause that seems extremely important for us to observe, document and understand. There are many possible explanations that merit attention: Some of them might be attributable to natural phenomena, but others may be far more insidious. It is important for the future of life on Earth that we solve this mystery sooner rather than later. Because if we don't understand this, we may sooner or later become victims of it.